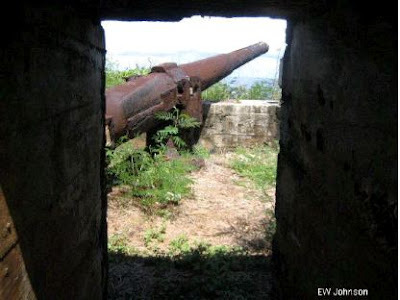 Japanese WWII 6" cannon at Nafutan Point. The name Nafutan was changed sometime after WWII to Naftan. 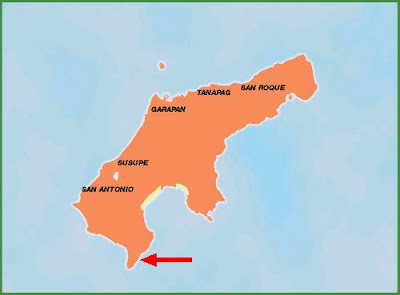 Naftan Peninsula is the Southern most part of Saipan. Nothing has changed there for the past 65 years making Naftan Peninsula perfect for the boonie stomper, WWII buff, and view seeker, however, I have rarely seen anyone there. Nafutan Peninsula was a U.S. military blunder involving two U.S. battlefield generals, one was fired from duty during the battle. The peninsula is an ideal area to defend and nearly impossible to attack. 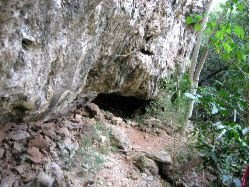 It took U.S. troops 9 days to conquer the steep cliffs, large plateaus, numerous caves, and dense brush. Today, the 4-wheel-drive road made before the battle still remains. 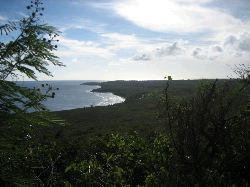 It runs along the high ridge over the entire length of the peninsula. Two roads break off the crest and lead down to the high ocean cliffs to the east. Numerous hiking trails lead to overlooks, caves, large crevasses, WWII bunkers, Japanese cannons and antiaircraft enclosures, Obyan Beach, and much more that I have yet to explore. Pre-war road still remains. Fortified caves everywhere. 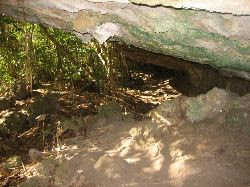 Inside the cave. 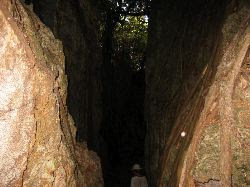 Very interesting hike through this crack in the cliff. World War II bullets everywhere. This is one of countless bombs and mortar rounds still sitting unexploded where it landed 65 years ago. 10 minute hike to get through this crevasse. I thought the sun went down early. Rugged terrain at Naftan Point. The white patches are bullet holes in the rock. Stairs leading to a Japanese spotter's overlook. View of Obyan Beach from the overlook. View of the airport from the spotter's overlook. View of the spotter's overlook from the airport. There are three of these Japanese 140-mm cannon bunkers at Naftan (1 picture below) near the spotter's overlook (4 pictures above). The guns had yet to be installed. U.S. marines found them still at the dock. I found a date in a cement wall near the bunkers dating one month prior to the battle. American casualties would have been greatly increased if the battle was delayed a month. Exploded and unexploded bombs everywhere. In 1995 (50 years after WWII) the Explosive Ordnance Disposal Mobile Unit Five conducted a survey of the ordnance on the Naftan Peninsula. They located (180) 500 lb bombs, (1000) 2 lb incinderary bombs, and (60) 3 and 4 inch projectiles. 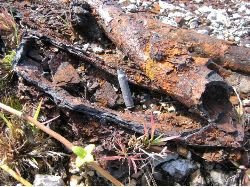 They recommended not to remove the ordnance due to its condition, remote location, and quantity involved. As a result, the EOD unit detonated 92,000 pounds of WWII ordnance collected on the Naftan Peninsula. Even still, finding remaining ordnance in the Naftan jungle is surprisingly easy. Naftan Peninsula is actually too large to be called a peninsula and should be called a cape. There's a reason why they call these guys Coconut Crabs. Those claws he's hiding behind actually can open a coconut, but it takes a long time and he really has to want that coconut open. This one is still a baby, perhaps 2-years-old. 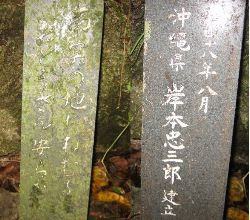 I found this marble marker with Japanese writing carved on both sides in an out-of-the-way part of the jungle on Naftan Peninsula. 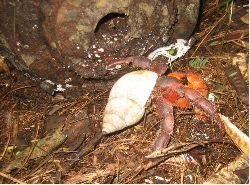 Here is an unexploded 500-pound bomb I found in the jungle of North Naftan and the local resident, a baby coconut crab. I wonder if he ever tried to open that huge mutant coconut in his front yard. 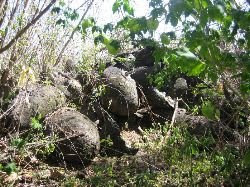 For the year after the Battle of Saipan until the end of WWII, massive numbers of bombs were stored in Nafutan waiting to be dropped on Japan. Thousands of ordnance bunkers were built; most were nothing more than a shallow hole in the ground. When the war ended the U.S. military tried to dispose of the bombs but not all. 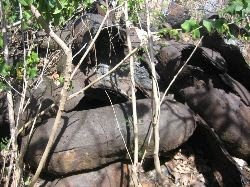 I took the below four pictures of one of those open-air bomb bunkers with at least twenty 500-pound live bombs in various states of decay with many more scattered around the surrounding area. I found these on the Eastern side of Nafutan Peninsula. Starting immediately after the battle of Saipan, which was more than a year before the end of WWII, most of Naftan and Marpi were placed off limits to everyone, even American soldiers. This "off limits" lasted for another twenty or so years after the end of WWII. Before the restriction was lifted, numerous live bombs were collected from the area and piled on top of a new live bomb. The theory was that they would detonate the new bomb on the bottom and all the older bombs on top would also explode. What actually happened was that the huge pile of WWII bombs on top were projected in every direction for miles. This spider is common in the jungles of Saipan. These webs can catch birds. My exploring buddy, Stewie. Pardon his tongue hanging out. This is a video from two of the high ocean cliffs on the east side of Naftan Peninsula. Video of some of the WWII ruins in Nafutan. Battle of Nafutan Part 1. Your knowledge of the Battle of Saipan is impressive not to mention your knowledge of the island itself. You're exposing hidden and forgotten sights. Thanks for sharing! By the way, say hello to Stewie the Explorer. Most excilent blog on the place. I'd love go round exploring the place. Thanks, and I would like to have the company. Thanks, I sure enjoy exploring the jungles. It's nice that you took the time to film along the way...not an easy task when boonie stomping. on Mt. Naftan between a U.S. artillery unit and the remaining 500 Japanese troops retuning from Asilto is not there to be found... as this did not happen. Once the "boxed in" Japanese slipped through an opening in the front lines, around mid-night on June 26, 1944, they hit Aslito Air Field, burned one plane and damaged 4 others. After creating this confusion, they continued moving north, as was their original plan, to Hill 500 where they thought they would find the Japanese Army's 47th Mixed Brigade. They instead, at around 5 A.M., found the 25th Marines now occuping Hill 500 and the fight ensued. Today, Hill 500 is shown as "Laderan Dan Dan" on the current U.S.G.S. topographical map for Saipan and Hill 500 was also General Saito's first Command Post location...the first of what turned out to be 5 as the General had to keep moving his command north as the battle worn on...but anyway, this group that left Naftan never had any intention of returning to Naftan from which they had now only just escaped. In fact, Capt. Sasaski had written out instructions out lining the events to take place including orders for the wounded to stay behind and defend Naftan to their death and also that those too wounded to fight were to commit "seppuku" and if not able to do this for themselves than they were to be 'helped" in carrying out that process. About the same time that Hill 500 started to erupt, another band from this same group that escaped Naftan fell upon the 14th Marine Artillery Regimnt in a position north of Aslito Field and south of Hill 500.
costing the Japanese another 20 to 25 men. This effectively ended the fighting for Naftan and the following day, the peninsula was swept clear to the ocean and declared secured. I should also like to say that it was the U.S. Army and not the Marines who fought on Naftan Point. The Army's 27th Division, 2nd Battalion, 165th and 105th Infantry were the ones who saw that entire operation through with the 105th carrying the entire load from the 22nd to the conclusion on the 28th. I did the same thing myself back in the 90's when stationed there. Too bad you couldn't get that "earthy" smell from the jungle to go on video...that's the only thing missing for the total experience....loved hearing the bird calls too...great videos and thanks so much for all the effort in making these available. Oh..that "pot" you picked up on the road leading out of Naftan on another video is actually a Japanese Army standard issue "mess pail" It was bent out of shape, had a bullet hole in it and was made of aluminum. Originally "kidney bean" in shape, it came with a top cover and an inner tray. It also had a very rustable metal bail to hold it over a fire to cook food or boil water in. If you find another, look close for two Japanese charactors scratched in the aluminum. The soldiers often put their names on these with something sharp and pointed. Thanks Alan. That was very informative. I wish I could edit in the corrections on the video. I guess your and other reader's comments will work. Thanks. Thanks for putting up this blog! I'm a photographer born and raised on saipan, but not even I know where are all these hidden spots and I've been looking for locations to do photo shoots and found 5 good spots just on this one post. Thanks J.Kyle. I'm glad you like it. Great posts, videos, comments and more. 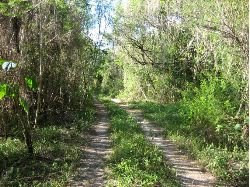 My father and I have hiked and ridden around Saipan a couple of times. But your details are nothing short of fantastic. The posts from other Saipan lovers are also excellent. If we ever come back to Saipan, we hope to coordinate a stomp with you. Thanks 2DSS, I will still be here if you wish to go on an adventure with me on your next trip. Thanks for looking around my Blogspot site and I'm glad you liked it. Thanks again for your posting! Thanks Mike. I too am an avid PBEM'er with "Combat Mission" (CMBO) for the past 10 years. I have also designed a Nafutan battle game as well as the entire Saipan battle. Do you have CMBO? Sorry, I don't have CMBO. Actually, never tried it before. Would like to have an "offline" discussion with you on the pros and cons of CMBO. Might be a "new" wargame purchase for me? Wow thanks for this blog. It is so cool that you live on saipan. I would love to go but I would have to convince my parents that I wont step on a live grenade or something of that sort. Just one question, is there really spirits of Japanese soldiers still haunting the battle ground? You may thing why is this kid asking these questions? Just to let you know I am a serious ww2 collector and also I am very aware of spirit activity. Nothing spooky it is just something that runs in my family. I have been looking for the spirits and they should be at the places I go. So far no luck. Thats too bad. Well at least you find really cool relics from the battle. I would really like to go there but then again I would need to convince my parents and get enough money for the trip. Hopefully I could come next year. Love reading your blog, so enlightning about what it is like there. Many thanks, Eric, for producing such a fine series of videos and photos to capture in time what remains of these historic battles that were so pivotal to the outcome of the war in the Pacific. Keep up the great work! Best of luck wherever your future Saipan explorations may take you, Stewie and your family. Thanks, I'm glad you like it. I hope to find more interesting history soon. This blog is impressive. My choice to visit Saipan was purely luck, and now I hope that I will have the opportunity to see one tenth of the sites you have cataloged here. I will be in Saipan for 2 1/2 days, do you have any recommendations for WWII sites that I should visit? Thanks Amaury. Marpi would be good for a day trip. It has many WWII sites that are easy to get to. Naftan is much more difficult unless you are with a guide. Hafa Adai. I was born and raised on Saipan...unfortunately, I never really was exposed to all these growing up. Now, 28 years of age...I am currently working as an Archaeologist in hopes to preserve certain relics/artifacts of not only my hometown but throughout the Pacific. I think you did a great job in this article-very informative as well! I appreciate you taking the time in learning and sharing the past! I had a great read! I realized there's still more things out there that i need to catch up on. THANKS again!